The New York serie paintings is directly inspired by a trip to New York City in 2017. I discovered this special city and fell in love with it. After my trip, I wanted to extend this one through 8 original watercolors evoking places that marked me and transported. My style: a liberated and emotional line. 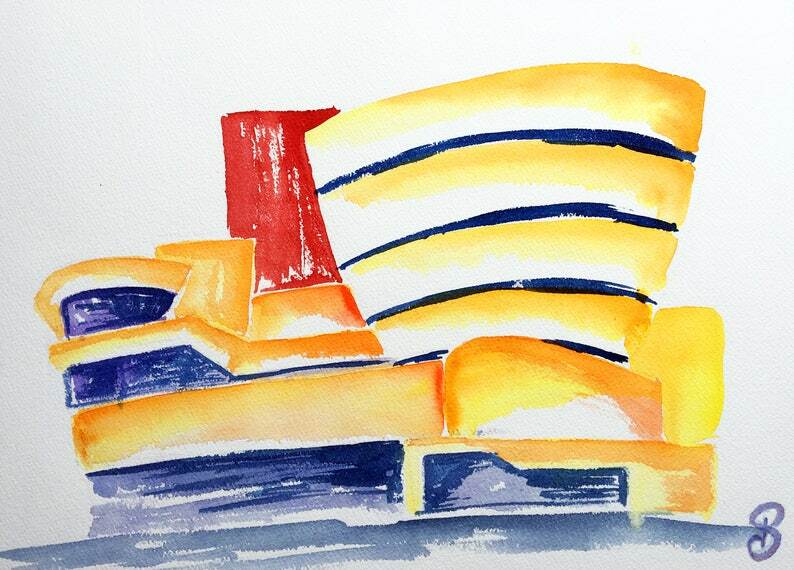 The watercolor "Guggenheim museum" is in the format 26 x 36 cm (10.24 x 14.17 inches), realized on paper Arches, 100% cotton, fine grain and a thickness of 300 grams. It is delivered with care, accompanied by a certificate of authenticity, signed front and back. * Specify in the order if it is to offer. * Warning, colors may vary from one screen to another even if I try to get closer to reality. The most amazing quality painting, absolutely beautiful!